Like all yachts, Long Passages is a compromise - the Shannon 38 ketch has a lot of features we like and a few we don't - here are our opinions. We like the full keel with encapsulated lead - the boat tracks very well and is very stable. The cut-away fore-foot makes her easy to steer. The downside is that she is difficult to steer in reverse. Although more complicated than a cutter, the ketch is a very versatile rig, providing many options for light and heavy conditions. She is not as quick up-wind as a cutter, but that is an acceptable compromise. With solid fiber hull, 1" at the turn of the bilge and over 1/2" at the waterline, we feel quite secure with her construction off-shore. The prevailing winds during a circumnavigation puts one on a Port tack much of the time, so having the galley on Starboard is a great convenience. Despite being almost 30 years old, she still attracts admiring comments in all ports on her pretty lines and lovely brightwork. Although we have not been in the 'ultimate storm', at 40 knots with breaking seas she has handled the conditions quite well, kept us secure and most of the noise out of the main cabin. Shannon Yachts is still in business 30 years on, and it has been a great help and comfort to be able to contact them and receive answers to questions and hard-to-find parts. We love to show it off, but maintenance is a chore - Judi probably spends 100 hours/year on sanding, varnishing and Cetol application. 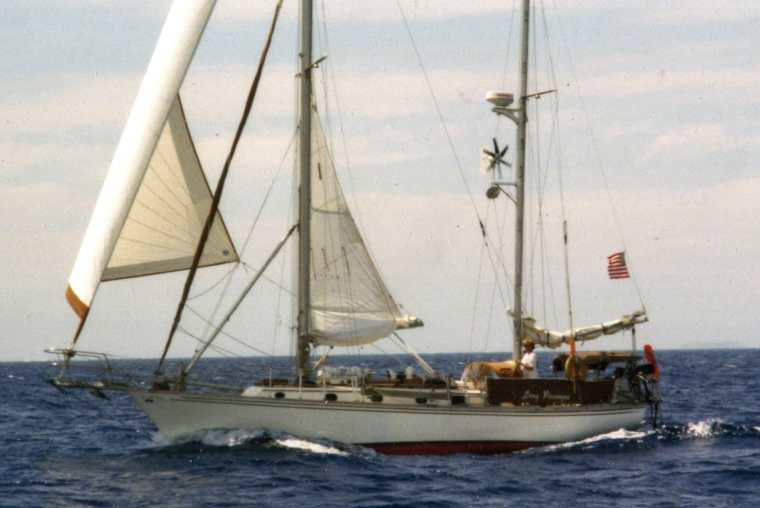 Necessary from a naval architect's standpoint, it adds length to the boat (translates into $$ in a marina) without adding living space, and it is not a fun place to be in 15' seas. The lovely lines of the Shannon 38 create 2' 6" freeboard at the cockpit. This makes for a wet cockpit when any kind of sea is running. We love the big cockpit when entertaining or sleeping in a quiet anchorage, but when a 15' seas breaks over us, the water retained by a cockpit 9' long and 8' wide takes a lot of time to drain.